The stylish 'Lever Lock' offers multiple feather choices for both left and right handed paddlers, and it can allow a shaft to be extended to a further 10 centemetres in length. One of the main advantages of this connector is the fact there is no need to carry an Allen Key, or tool, to tighten or adjust your setting. The connector can be fitted to Sea Kayaking paddles, and, Whitewater paddles. It is a clever device, very durable, easy to read, light and effective. 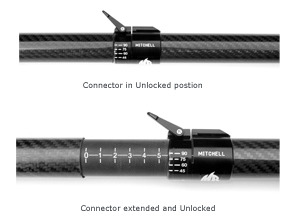 It can be fitted on our straight shafts, our carbon Ergotech 'neutral', and 'rear torque' cranks.